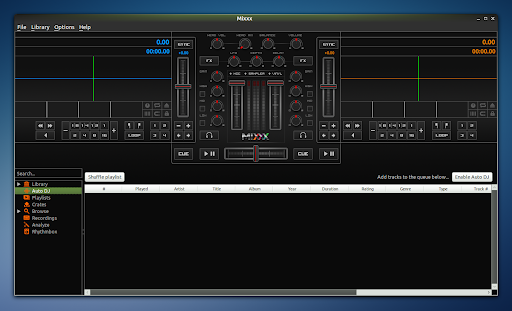 Mixxx is a free, cross-platform mixing software for DJs, providing features for both new and advanced users. It supports mp3, ogg, wave and flac playback and among the most important features are: automatic crossfading, playlists and crates, vinyl emulation, hot cues, pitch-independent time strech, BPM detection and estimation, multichannel soundcard suport and lots more. There are also various library / user interface improvements: much faster iTunes and Rhythmbox support, improved browser mode, new and updated skins as well as limited internationalization support. The complete Mixxx 1.10 beta changelog can be found here. Please note that if you've added the Mixxx beta PPA, you can't install Mixxx stable too! Mixxx 1.10 is currently in beta so you will probably find bugs. Report them here. 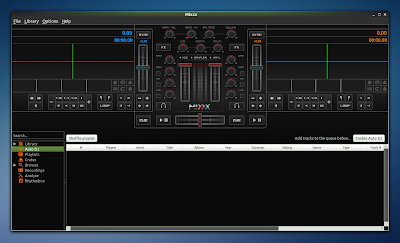 For other Linux distributions, Windows and Mac OSX, download Mixxx from HERE.